Pupils from King’s have been attending Confirmation classes since October to help them understand the Christian faith more deeply and to discuss ways of living out their faith in today’s world. Confirmation is the rite in which baptised Christians affirm their faith and decide for themselves to belong to the Church. 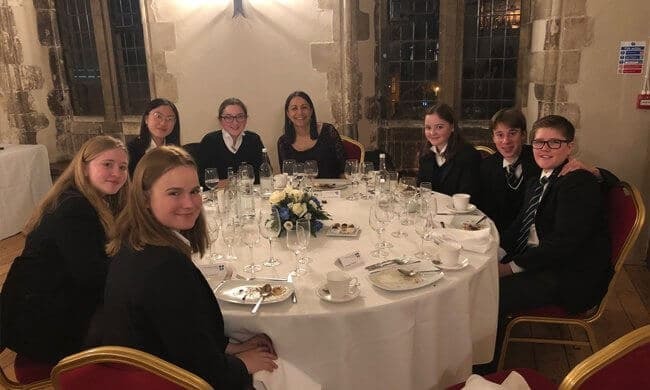 The Confirmation course finished with a dinner in the Gateway Chamber for all the candidates and for the Chapel Wardens who are the sixth form Chapel prefects who help to support the work of the Chaplaincy. The candidates will be confirmed in the Cathedral on Sunday 10th February at 5.30pm by the Bishop of Dover, the Right Reverend Trevor Willmott.